Ely is moving to Seattle as the company’s Director of Customer Satisfaction and Reconditioning. “Mitch has been critical to our success over the past three years, and I am pleased to see his hard work and dedication to Genie has been recognised with an overseas appointment,” said Brad Lawrence, Genie General Manager, Terex AWP. Ely joined Genie in 1998 after a decade of experience as a technician in the hire industry. Starting out in field services, he was promoted to National Operations Manager in 2000. Responsible for Genie’s technical services, Ely oversaw design, engineering, spare parts, service, training and quality control. Until he moves in mid-August, he’s onboarding the new Genie managers into their roles. 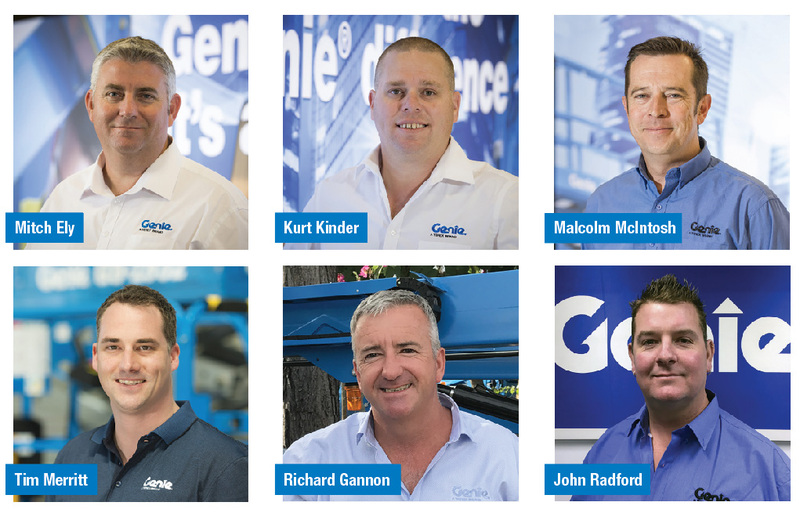 “Mitch’s support over the next few transitional months will ensure that it will be business as usual at Genie for all our customers,” said Lawrence. Kurt Kinder has been promoted to National Sales Manager, responsible for sales in Australia and NZ. “Kurt has a wealth of sales management experience from previous roles in national rental companies and his own access business in NZ,” noted Lawrence, to whom Kinder will report. Richard Gannon has accepted the role of Regional Sales Manager (QLD/NZ). Gannon arrives at Genie from Haulotte, with over 10 years of AWP sales experience. “Richard is a very well-respected sales manager in our industry and we are lucky to have him as part of the Genie team,” said Lawrence. Malcolm McIntosh has been promoted to National Customer Support Manager, responsible for all service, pre-delivery, workshop and heavy maintenance teams. “Mal has extensive management experience from previous roles in a number of other companies, and this experience will be invaluable as we continue to roll out our ‘Customer Experience’ and ‘Genie 360 Support’ strategies,” said Lawrence. A new position has been established: National Product Support Manager, reporting to Lawrence. Tim Merritt steps into the position, responsible for technical support, training, quality and the newly created role of sales support. “Tim has outstanding technical knowledge and is well respected — these attributes will be invaluable to the sales team moving forward,” said Lawrence. John Radford has been promoted to Customer Support Manager — Victoria. “John has been an outstanding Genie team member for many years, and this promotion is just reward for his dedication,” said Lawrence.